Japan has distinctive four seasons of spring, summer, fall and winter. In addition, Japanese people have been strongly rooted to cherish the change of seasons. It can be shown in Kigo of Haiku. There is a way to express seasons, called “24 Seasons,” which has divided the four seasons further into 24 seasons. We are really enjoying the change of seasons. Although we can enjoy spring, summer, fall, and winter in Japan, among them, the highlights are cherry blossom viewing in spring and autumn leaves in fall. Autumn leave season is a popular tourism season for both customers from overseas and from Japan, as well as cherry blossom season in spring. The best season of autumn leaves starts from around mid-September at high altitude places and Hokkaido. In Kyushu, you can enjoy it until mid-December. In addition, the location where you can enjoy autumn leaves is also different. You can enjoy autumn leaves in various situations, such as onsen and autumn leaves, autumn leaves of an entire mountain, autumn leaves and waterfall, mountain stream with autumn leaves, lake and autumn leaves, autumn leaves and buildings such as shrines and temples, and so on. 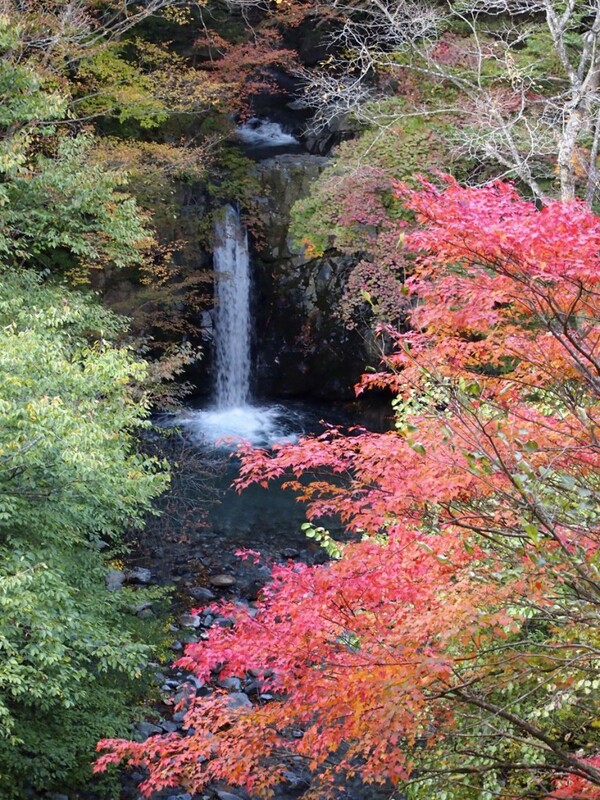 Our Shima Onsen has also so beautiful autumn leaves that the entire town is the attraction. 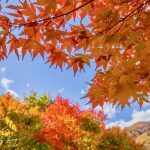 Yet, I will introduce the other attractions of autumn leaves, which are popular to foreign customers, referring to a book, “Travel Rankings in Japan” (Edited by Trip Advisor) and various WEB rankings. 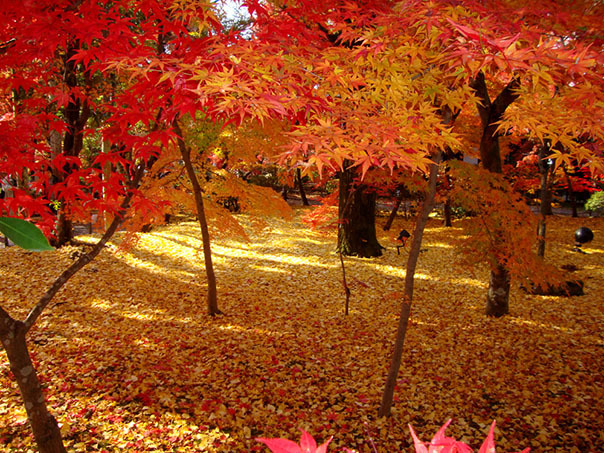 The most popular autumn leaves are at Kyoto, the international tourist city. Kyoto has high popularity of autumn leaves at buildings such as shrines and temples. Among them, “Zenrinji Eikan-do” is the most popular. In addition, other popular spots are such as Tofukuji, Kodaiji, Shinshogokurakuji. When talking about autumn leaves, we tend to imagine only maple trees. Yet, the beautiful yellow ginkgo can be seen as tree-lined at Jingu Gaien in Tokyo. It is nice to be able to see scenes like this in the city center, isn’t it? 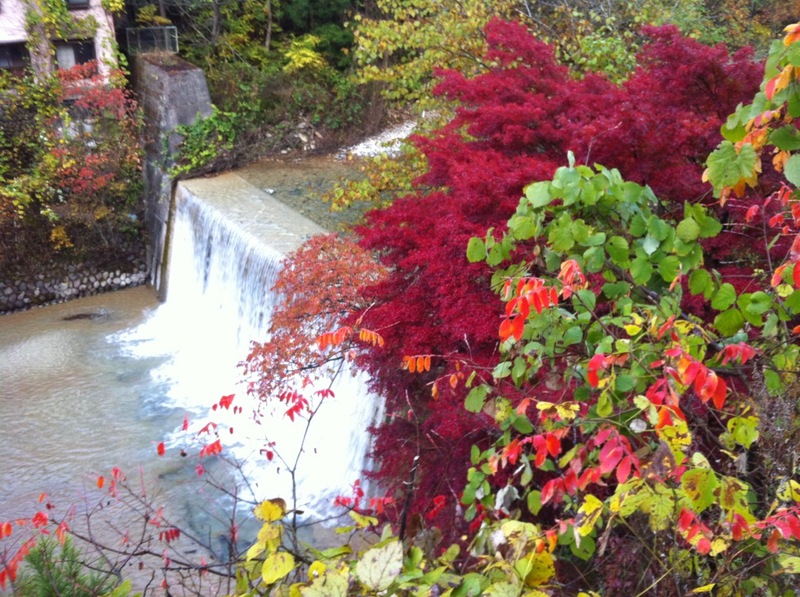 Minoo Waterfalls in Osaka have beautiful waterfalls and autumn leaves. Korankei at Toyoda, Aichi, has beautiful valley and autumn leaves. They are always ranked in the best places in autumn leaves rankings. It is an autumn leaves spot, representing the West Japan. 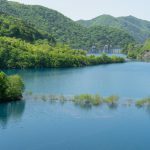 In addition, Unjoike at Karuizawa, Nagano, Entsuin at Matsushima, Miyagi, and Irohazaka at Nikko, Tochigi are also well-known. It is said that autumn leaves become beautiful if the weather is good at the beginning of fall and the temperature difference between day and night is big. The north part of Gunma, where we live, has a perfect condition for that as the altitude is high. 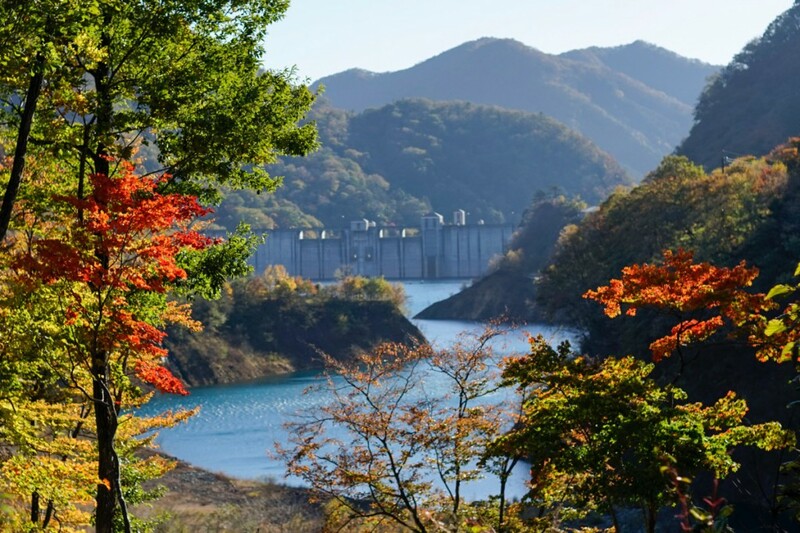 Thus, there are various autumn leaves attractions at each area. Tenjin-daira at Tanigawadake, Agatsuma-keikoku, Mt. Myōgi, Marunuma plateau, Kusatsu Mt. Shirane, Manza onsen, Mt. Akagi, Mt. Haruna, and much more. We cannot count them all. 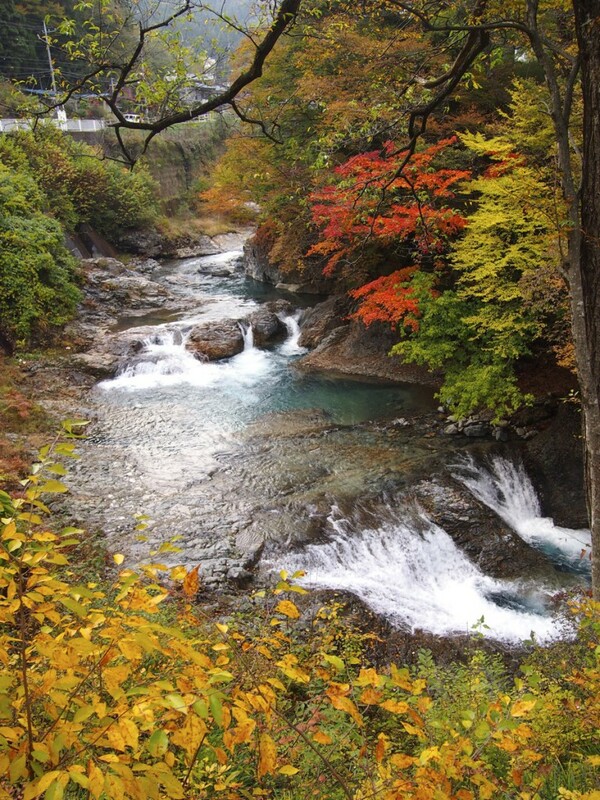 It is not an exaggeration to say that the entire town is the attraction of autumn leaves in the range of about 6km north to south along Shima River. At Kashiwaya Ryokan, you can enjoy stunning autumn leaves from a terrace of rooms and private open-air bath. 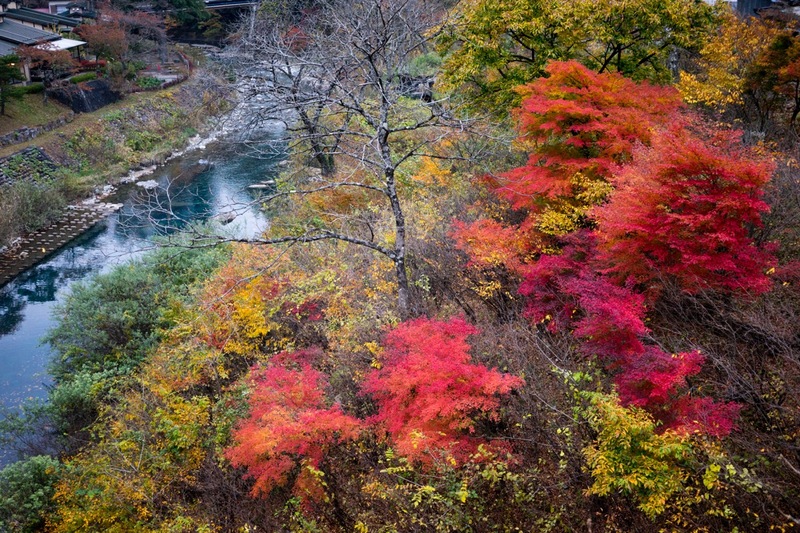 There are a lot of beautiful autumn leaves spots along Shima River. Ouketsu, Momotaro Waterfall, Tsukimi Bridge, Ochiai Bridge, Husenkyo, Koizumi Falls, Hinatami Yakushi, Ogura Waterfalls, Maya Waterfalls, Okushima Lake, and lot of spots other than them. By all means, please visit Japan in autumn leaves season. You can surely meet beautiful landscapes of Japan. 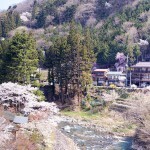 Enjoy Hanami at Shima Onsen! When is the best time to see cherry blossoms here? 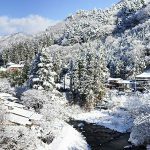 Winter in Japan: Open-air Onsen, Scenic Snowscapes, Skiing and More!